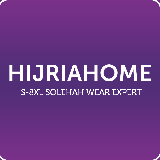 Founded in end of 2010, Hijriahome's expertise is Long Blouses & Tunics in helping Muslimah especially the Plus Sizes & breastfeeding mommies to look elegant in Hijriahome stylish, practical and Syari'e ready-to-wear. The issue today, is the lack of Muslimah Long Blouse that meets the criteria; long and loose and have options for Plus sizes. In 2014, we opened up our Physical Boutique in Bandar Sri Permaisuri, Cheras, KL to be closer to our customers.